This Irish blessing plaque features the Claddagh and it is ideal for placement over the door. 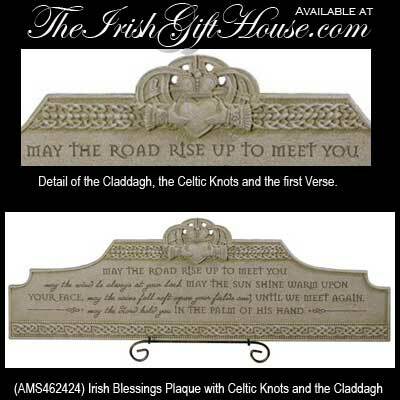 This Irish blessing plaque features the Claddagh along with Celtic knot-work and a dimensional design. The Claddagh plaque is made of cement and resin and measures 19" wide x 6" tall and it is ready to hang on your wall or stand with the included metal stand. This Irish blessing plaque is suitable for outdoor use and is ideal for hanging over a door. This Irish blessing plaque is gift boxed with Claddagh and Celtic knot history cards that are complements of The Irish Gift House.